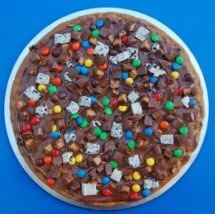 Create this chocolate peanut butter pizza with the kids! This dessert pizza is awesome for anyone that loves chocolate and peanut butter. Chocolate pizza recipe - hummmm, the only thing better than combining chocolate with pizza is adding peanut butter into the mix. And I LOVE peanut butter! This recipe is sure to be a delicious, sweet crowd-pleaser. NOTE: The pizza may be made ahead and refrigerated, covered, until ready to use. To use, bring to room temperature before cutting and serving (if you don't bring to room temperature, it will crack when sliced). Toppings: Heath candy bars or Butterfinger bars coarsely chopped (can also add marshmallows, cherries, white chocolate, and bananas - whatever sounds good to you!). Preheat oven to 350 degrees F. Lightly grease a 12- to 14-inch pizza pan. In a large bowl, cream butter, sugar, brown sugar, and peanut butter until light and fluffy. Beat in egg, flour, and baking soda. Stir in 1/2 of the chocolate chips. Press the dough onto the pizza pan, leaving a one-inch edge as the cookie will spread as it bakes. Bake 18 to 24 minutes until light brown. Remove from oven and immediately sprinkle remaining chocolate chips over the top and drop spoonfuls of peanut butter over the top; let rest for approximately 5 minutes or until chocolate is shiny and soft. With a knife, smooth out the chocolate. Let pizza cool before cutting and serving. Serve at room temperature.